It’s easy to curse the darkness, and many among us regularly do. Only a few actually try to light even a small candle to fight it. 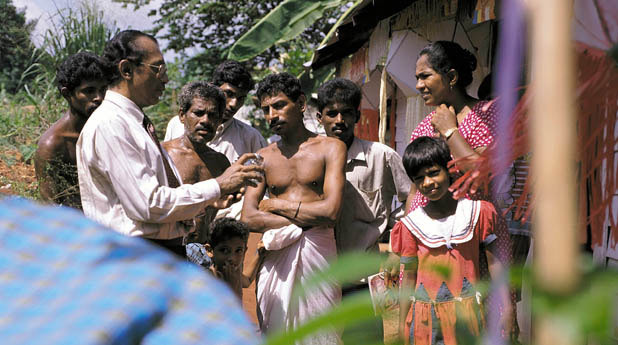 Dr Wijaya Godakumbura of Sri Lanka is one of them – he literally lights lamps, thousands of them, against the darkness of ignorance and poverty. But his lamps are different, and a great deal safer compared to normal lamps and kerosene, which can start fires risking life and property of users. The design is simple yet effective, inspired in part by the Marmite bottle known the world over: it’s small and squat, with two flat sides – equipped with a safe metal screw cap to hold the wick. It’s quite stable and hard to topple. Surgeon turned inventor and social activist, Dr Godakumbura founded and runs the Safe Bottle Lamp Foundation which distributes safe, virtually unbreakable kerosene lamps to those who can’t afford electricity. For these untiring efforts that have saved hundreds of lives, the good doctor and his organisation have just been selected the overall global winner in the 5th annual World Challenge awards conducted jointly by BBC World News and Newsweek, together with Shell. The Safe Bottle Lamp Foundation received a $20,000 grant from Shell to invest in the future of the project. The winner and runners-up were felicitated at an awards ceremony in the City of The Hague on 1 December 2009. Now in its fifth year, World Challenge 2009 is a global competition aimed at finding projects or small businesses from around the world that have shown enterprise and innovation at a grass roots level. World Challenge is brought to you by BBC World News and Newsweek, in association with Shell, and is about championing and rewarding projects and business which really make a difference. A record breaking 900 plus nominations were received this year and from these, twelve finalists were chosen by a panel of expert judges. BBC World News viewers and Newsweek readers then selected their favourite from these dozen unique and inspiring entries by casting more than 127,800 votes at http://www.theworldchallenge.co.uk. Dr Godakumbura and his foundation have been recognised many times before. Notable among these honours is the Rolex Award for Enterprise in 1998. Read Rolex profile about him and his continuing work. BBC/Shell World Challenge series producer is my former colleague Robert Lamb, who has blazed many new trails in broadcast television and development communication. He specialises in telling complex environmental stories in engaging terms using moving images, and now runs his own independent film production company One Planet Pictures in the UK. At the beginning of the World Challenge 2009 process, Robert wrote in the producer’s blog: “World Challenge is now in its fifth year. Over that time we have received thousands of nominations. Sadly, we have only been able to film a small selection. But it’s enough to know that there are millions of points of light out there. Watching the news is easy to forget that the vast majority of people go about their lives peacefully and productively.